/ Im oberen, flachen Gletscherbecken des Rotmoosferners. High alpine crossing, where you can choose between two grand departure variants. The trip to the Hinterer Seelenkogel 3470m from the Rotmoostal is a high alpine crossing, where you can choose between two grand departure variants. The descent along the ascent trail is no less spectacular and skitechnically just as challenging as the variation over the column-wide waterfall ferry. 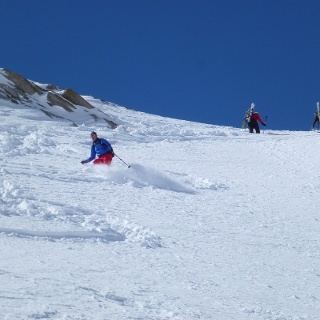 For both descent possibilities it is necessary from the start very safe avalanche conditions. The trip to the Hinterer Seelenkogel 3470m from the Rotmoostal is a high alpine crossing, where you can choose between two grand departure variants. The descent along the ascent trail is no less spectacular and skitechnically just as challenging as the variation over the column-wide waterfall ferry. 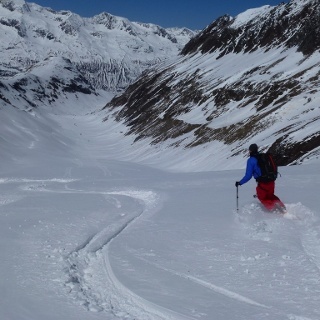 For both descent possibilities it is necessary from the start very safe avalanche conditions. However, what is added to the descent over the waterfall ferry is the great risk of gnawing, which is why you should stick to the given route guidance, consistently in the whole western part of the glacier. In addition, the more than 40 ° steep and rocky passage at the end of the glacier tongue down into the valley floor of the Rotmoostale. 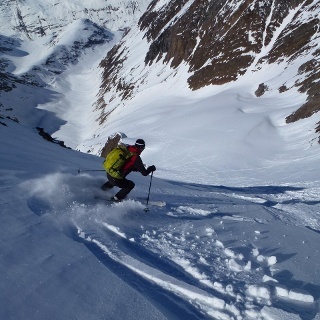 If one were to decide for this route, not only should very safe avalanche conditions prevail, but also worthwhile snow conditions should prevail, so that the choice of this objectively more dangerous route can actually be justified. But also on the descent in the area of ​​the ascent one is skitechnisch with steep flights over 40 °. For this, the column danger is only to be classified as low. However, very safe avalanche conditions are also required in this area. 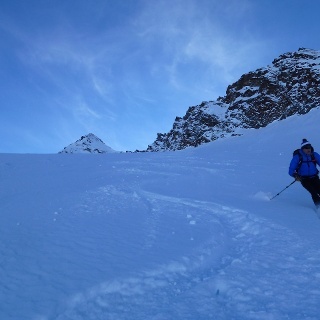 If you start the ascent in Obergurgl at the valley station of the Hohe Mutbahn in 1920m you have to estimate about 4.5 hours of pure ascent over 10.5 kilometers and 1560 meters of altitude. 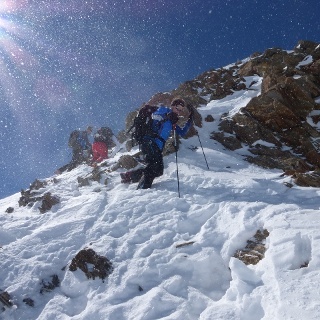 If favorable snow and avalanche conditions can be achieved, one can reduce the ascent time by 1.5 hours, the altitude to be traversed by 500 and the distance kilometers by almost half by means of the Hohe Mutbahn I + II. However, the long crossing of the 35 ° to 40 ° steep western slopes on the Hohen Mut down into the Redmoostal is only recommended in the morning, when the conditions of the melt hard. At Pt. 2400m then you start the actual ascent up to the Rotmoosjoch 3055m. On the Rotmoosjoch 3055m you will change to the South Tyrolean side of the Ötztal main camp and you will climb over the more than 40 ° steep plan remover. At the upper end you can reach the flat, upper glacier plateau of the waterfall. On the way up there are good ice conditions, but it is absolutely necessary. In the case of unfavorable snow conditions, crampons and / or an ice ax should be carried with them. As can be seen from the photos, there can even be plank spots in the steepest passage. The last meters in the area of ​​the summit construction are hardly a problem. 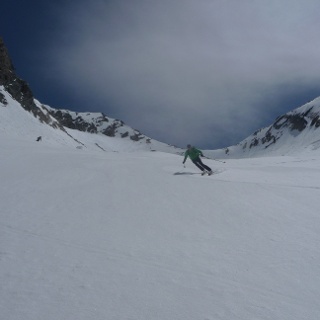 With favorable conditions one can ascend to the highest point with skinned skis. 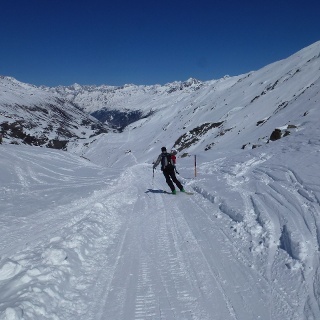 This tour together with the possible downhill ride over the waterfall ferry should be reserved for alpin experienced and skitechnisch perfect ski mountaineers.